As part of the Great Western Mainline electrification programme, numerous road overbridges are having to be rebuilt to increase the headroom for the overhead wires. One of these is the A417 bridge at Challow. It was closed to traffic on 6 September 2014, and the old steel bridge was removed during a full line possession. 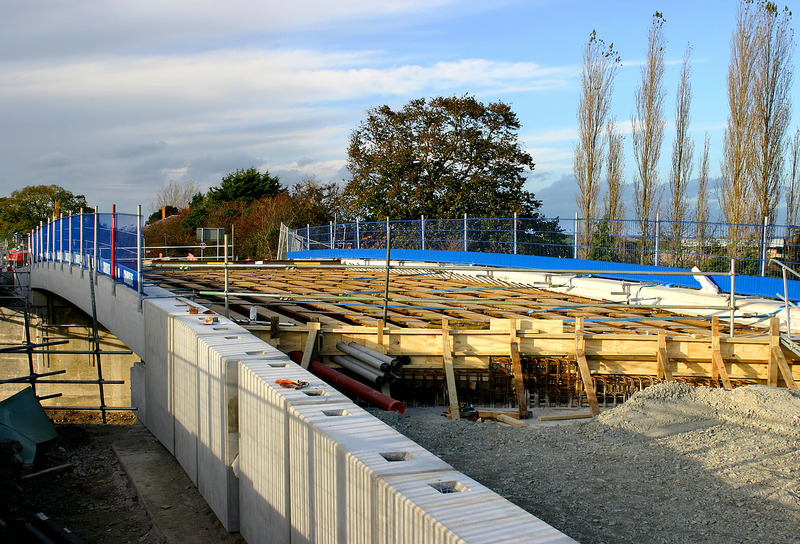 This view, taken on 1 November 2014 from the temporary footbridge, shows the new roadway beams in place. Presumably the new structure will be mostly concrete, and not require much upkeep. Just as well, as Network Rail have a very poor record when it comes to such simple things as painting metal structures. The previous bridge at Challow had got into a very poor state, due to lack of maintenance.